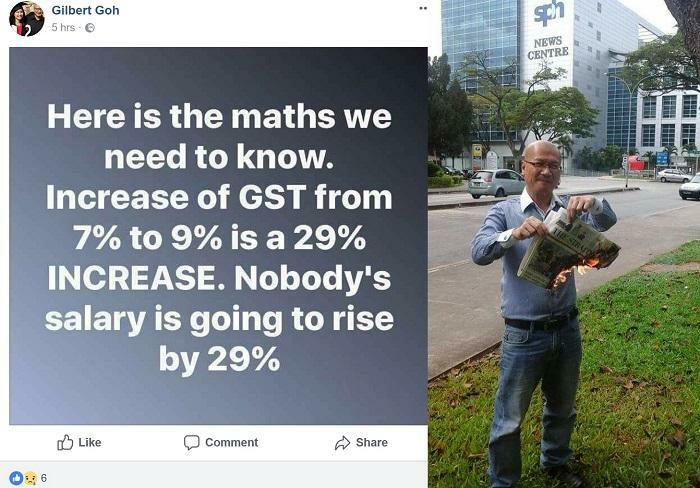 Spore Social Activist Gilbert Goh Spreads Fake News; Claims 2% GST Increase Is Actually 29% Increase; Makes Poor Misleading Comparison To Salary Increase – Sinking It In! Prominent social activist Mr Gilbert Goh made a Facebook post reminding Singaporeans of the mathematics behind the upcoming 2% gst increase. Mr Goh shared that although it was a 2 percentage point increase, the increase was infact almost a 29% increase in GST for Singaporeans. This is mathematically sound until Mr Goh tried to link this 29% increase in GST revenue to Singaporeans needing a 29% increase in salary to maintain parity or status quo in their spending power. Unfortunately, Mr Goh conflated two different factors and tried to paint the GST increase as much more than it would affect Singaporeans livelihood. By doing simple maths, the real increase in cost of living with the implementation of a 9% GST would still be 2%. Assuming a packet of rice cost $10.70 when GST was 7%, when the GST increases to 9%, the new price for the packet of rice would be $10.90 assuming private companies do not take the opportunity to unfairly raise prices. With this 20 cents increase, in percentage terms, it is a 2% real increase unlike the 29% Mr Goh would like you to believe. Do some simple maths before asking your boss for a 3% salary increase to offset the GST in 2021, do not be misinformed, ask for a 29% salary increase and make a fool of ourselves.